Epiphone guitars come from different factories in different countries. For this reason, it is not so easy to know where each guitar comes from or when it is made. 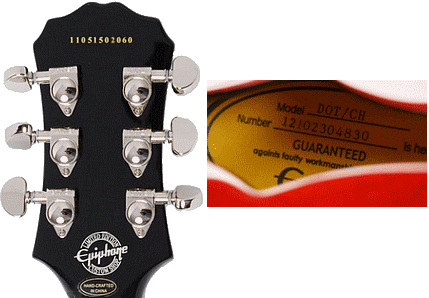 Epiphone stamps a serial number on each guitar, after decoding it can tell you where and when it was built. Locate the serial number on the back of the guitar head. With Semi-Hollow models on the label inside the top f-hole and with acoustic guitars on the label inside the sound hole. It consists of a number of figures, often also in advance of one or two letters. If you want to know the production year of your Epiphone guitar, you can decipher it with the serial number decoder, or find it in explanation about the dating system below. Epiphone was an independent brand from 1924 to 1957. Since May 10, 1957, Epiphone is part of Gibson and is going to make more and more Gibson models. At the beginning of 1970 the production under license from Gibson moved from the US to Japan. From 1983 there is also produced in Korea and then in 1995 also in Indonesia. In 2004, Gibson opened a factory in Qingdao, China for the production of Epiphone guitars. Although the vast production of Epiphone guitars takes place in these countries, some more exclusive models are still being made in the US. The stamped serial number can consist of a series of numbers, or letter(s) and numbers. The last 5 digits form the series sequence number. Serial number 11051502060 is the 2060th guitar built in May 2011 at the Qingdao factory in China. The first digit shows the last digit of the year. These are Solidbody guitars built from 1958 to 1960 by Epiphone/Gibson in Kalamazoo, USA. Seven digit serial numbers do not have a factory code, here is the first digit the last year of the decade. The 2nd and 3rd numbers represent the month. These were manufactured in Korea by Samick between 1984 and 1995. Eight and nine digit serial numbers without a factory code. These were used respectively from 1990 and 1988 and also manufactured by Samick in Korea. The letter indicates the factory code and the first digit is the last digit of the year (since 2002). The factory code can be an F or a T here. Example: Serial number T32222 is the 2222th guitar of 2003 built in the factory of Terada Gakki Seisakusyo, Japan. The letter indicates the factory code and the first and second digit are the last two digits of the year. Example: Serial number Z051234 is the 1234th guitar built in 2005 at the Zaozhuang Saehan factory in China. The letters indicate the factory code and the first digit is the last digit of the year. Example: Serial number CI21234 is the 1234th guitar built in 2002 at the Cort, Indonesia factory. The letter indicates the factory code and the first digit is the last digit of the year. The 3rd and 4th digits represent the month. The last 4 digits form the series sequence number. Example: Serial number S6031234 is the 1234th guitar built in 1986, 1996 or 2006 at the Samick factory in Korea. The letter indicates the factory code and the next two digits are the last two digits of the year. Example: Serial number R04E0123 is the 123st guitar of May 2004, built in the Peerless factory, Korea. The letter indicates the factory code, the next two digits are the last two digits of the year. Example: C99040233 is the 233rd guitar of April 1999, built in the Cort factory, Korea. Example: S07C00122 is the 122th guitar of May 2004, built at the Samick factory in Korea. The 2 letters indicate the factory code, the next two digits are the last two digits of the year. The 5th and 6th figures represent the month. Example: SI02060234 is the 234th guitar of June 2002, built at the Samick factory in Bogor, Indonesia. The acoustic guitars from Epiphone, which were manufactured by Matsumoku in Japan from 1970 to 1987, are not reliable serial numbering system, but can be approximately dated by color and inscription from the Epiphone label. The first blue labels that were used were leftover labels from the Kalamazoo factory. In the bottom left corner of these labels is printed "Union Made" and stamped, "Made in Japan". Until supplies ran out, they were used from 1970 until the beginning of 1971. Some of these first labels do not include Made in Japan or Union Made. After supplies ran out, new blue labels were used where in the lower right corner "Made in Japan" is printed. The Lincolnwood label was also used for the acoustic guitars of the Taiwanese "Ep" series from 1979-1980. These labels in the bottom right corner say, 'Made in Taiwan'. From 1980 to 1987 a mottled label was used. In 2004 Gibson opened a factory in Qingdao, China, which produces Epiphone guitars. No labels have been used here, but stickers with "Made in China" are glued to the neck of the guitars.